I joined Twitter! Come by and follow me at HQSuz so I can follow you back. A very happy Tuesday to you all...to those of you sweltering in the heat I feel for you. I apologize in advance for telling you that here in Southern California we are enjoying perfect weather - it's about 65 degrees with bluebird skies at 8am. I have a movie date with my boys this afternoon to see HP 7.2 but am compelled to admit that I've not seen HP 7.1. Now that my boys are older I rarely see movies with my boys anymore so HP 7.1 just passed me by. 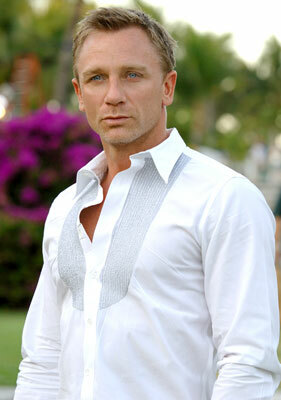 A movie I won't be missing in the theater is Coyboys and Aliens - I never pass up a chance to see Daniel Craig on the big screen. I finally recorded HQ Episode 11 last night at about 7pm while the house was quiet -well my house was quiet but the dog next door would not stop barking! Hopefully the barking doesn't come through. In episode 11 talk about Dowry Quilts, Trousseaus and Hope Chests and I added in what I've been cooking and reading and a whole lot of other quilty goodness. 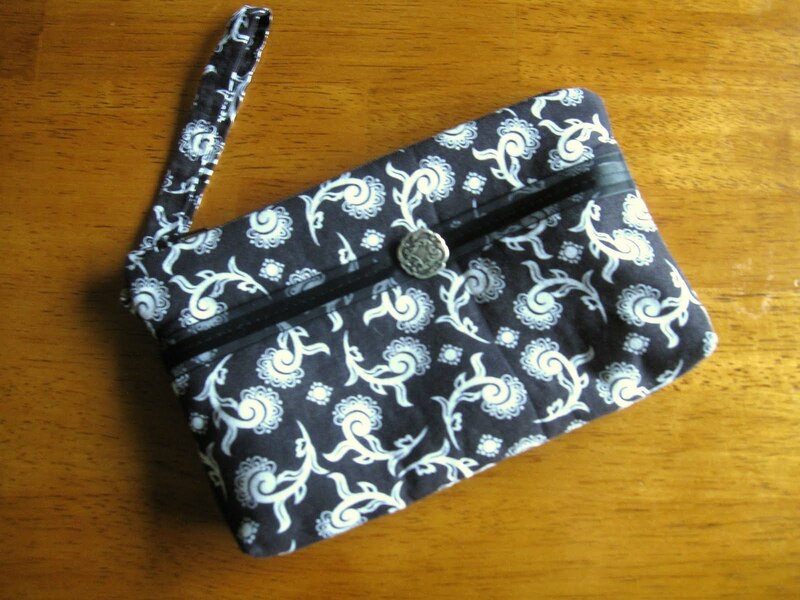 My Little Glam Bag - pattern by Pink Sand Beach Designs. 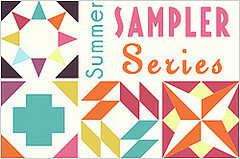 Summer Sampler Series hosted by Faith of Fresh Lemons Quilts, Lee of Freshly Pieced and Katie of Swim Bike Quilt. Gloria from Escondido e-mailed me about the "1800's Club" she belongs to. They meet at The Crazy 9 Patch Quilt Shop in Ramona, CA. The club gets together to share and sew about the history of quilts with a focus on the Civil War Era. Wished I lived closer to Ramona as I would love to be a part of this group. 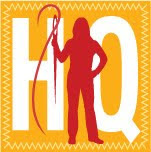 The San Diego Quilt Show is coming up - September 8-10, 2011. I will be going to this show and would love to meet with any listeners on Saturday, September 10th in the morning. Send me an e-mail or comment if you want to meet up. The Long Beach Quilt Festival is just around the corner! I'll be meeting up with listener Ann from Santa Barbara on Saturday, July 30th at 12:45pm just before the 1:00pm showing of Stitched - the quilting documentary. Send me an e-mail or comment if you want to join us. I met Eileen Wintermute, a local Southern California quilter during the Southern California Quilt Run a few weeks ago. She will have a quilt on display in the Bridges exhibit at the Long Beach Quilt Festival. Please visit her blog at http://eileenwintemute.blogspot.com/ and view her gorgeous mixed media and art quilts. Last up for the podcast was food - Tuscan Lemon Chicken and Garlic Ciabatta Bread both recipes from Barefoot Contessa Back to Basics cookbook by Ina Garten. Cooking a whole chicken on the grill intrigued me as we had never tried it before. I bought a 4 pound chicken, cut down the backbone and flattened it. After cutting out the breastbone, I placed it in the garlic, olive oil, lemon juice, lemon zest, rosemary and S&P marinade for about four hours. The chicken was very good and I will make it again although it took quite a bit longer on the grill than is explained in the recipe. Recipe said 12-15 minutes per side but it really took about 45 minutes total. 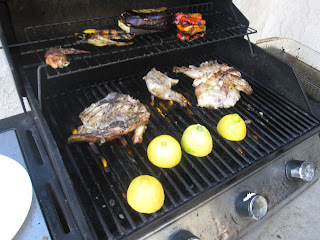 Lemons on the grill - very tasty! It's a well used grill. 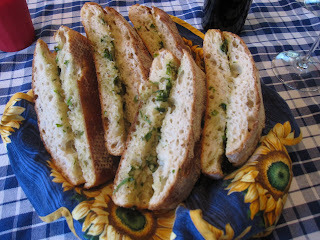 Garlic Ciabatta Bread - to die for. Saturday night's dinner was a hit with two new recipes that I'll make again. 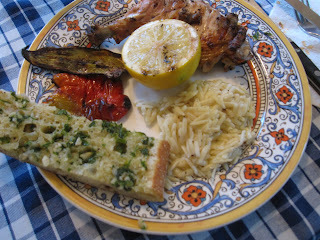 Tuscan Lemon Chicken, Garlic Ciabatta Bread, grilled lemon halves, assorted grilled veggies and orzo and paired with a glass of Sangiovese, made for a great meal. Hey Suz! Just listened to your podcast & really enjoyed it! How kind of you to mention me & my blog - ha. Very fun. And today I didn't get my Tuesday blogpost done. I had a plan; we'll see if I can get to it; if not, there's always next week! Anyway, your chicken & foccacia dinner sounds fantastic. I have that cookbook (duh) so will check it out. What did you do with the grilled lemons? Enjoyed your talk about hope chests. I actually had one AND it is a LANE! I got married in 1979, & confess I was the only girl I knew with a hope chest, but it was a tradition in our family....I had embroidered dish towels, some kitchenware - can't even remember what all, but it was pretty full. These days I use it to store our baby books, baby clothes I can't bear to part with, and special memorabilia. Anyway - enjoyed the show! Thanks. Really enjoyed this episode. It gave me an idea to do a blog post about my own hope chest made for me by my mom and dad. They gave it to me at my wedding shower (April 2004), and my dad put it together and my mom painted it and monogrammed the lid with my new married initials. Inside she put a set of very luxurious bath towels and 1000 thread count sheets!!!! Both the towels and sheets she had monogrammed with my and my husband's first and last initials. It was one of the most special gifts I've ever received and I still have it in my bedroom. What's funny is that my hope chest prompted the mom's who were also at my shower to do a similar hope chest for their daughter's (my girlfriends) when they got married in the later years...so my Mom kind of "re-ignited" the hope chest tradition with a modern twist for us...cool huh?